Not my most conventional post, but guest posts are intended to be educational for myself as well as my readers. In recent years, there have been huge developments and acceptance of plastic surgery and aesthetic treatments. While I don't have the courage to do drastic changes to my face, I do believe that there are others out there who require this treatment, especially if they have had an accident or injury. Last year, I tried out laser facial treatment for the first time and I really liked the results. 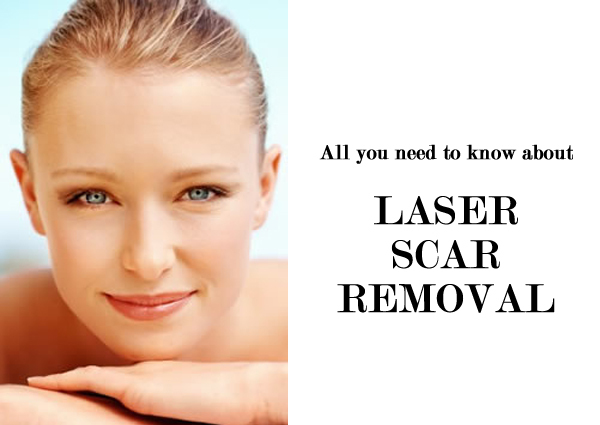 Did you know that there are many kinds of laser treatments, and one intended use for that is for scar removal? Here's an article to help you understand more about this type of treatment before going for it. Scars can be a painful reminder of a past experience. Especially when they are in a very visible area, they can affect your confidence. Fortunately, there are many options to treat scars including surgery, lasers and injections. So, whether you have a bumpy, indented, red or brown scar, it’s very likely that there is an option for you. What are the options for bumpy scars? Raised bumpy scars are referred to as hypertrophic or keloid. The difference between a raised scar and a keloid is that keloid scars can grow beyond the area of the original injury, whereas generic bumpy scars stay within the area of the injury. Both of these types of scars can be treated effectively with steroid injections. At our practice, we prefer Kenalog injections as we have found this medication works the best to flatten the scars. Although the scar may still have a different texture, the goal of steroid injections is to get rid of the bumpiness. Kenalog can be injected in different concentrations and different amounts, which will affect results. How are red scars treated? The normal healing process for injuries to the skin involves the development of new capillaries (small veins) around the site of the injury. These small blood vessels increase blood flow in the area helping to prevent infection and aid in the healing process. The downside to this healing process is that in some cases, the small capillaries contribute to a persistent red appearance around the scar. For red scars, lasers are very effective at getting rid of the small veins and decreasing the redness. We use a pulsed dye laser and two very common types of pulsed dye lasers are Cynosure V-Star and Candela V-Beam. Alternatively, Intense Pulsed Light (IPL) may have some benefit but because it is not a laser, it is not the ideal equipment. Several treatments can be required to diminish or remove the redness. How can I get rid of dark scars? Dark scars typically occur in patients with darker skin types. African Americans, Asians and Hispanics tend to get dark scars after a traumatic injury. This happens when Melanin (what colors the skin) aggregates around the scar during the healing process. The melanin deposits often resolve on their own with time, but in some cases the deposits need to be removed using laser treatments. 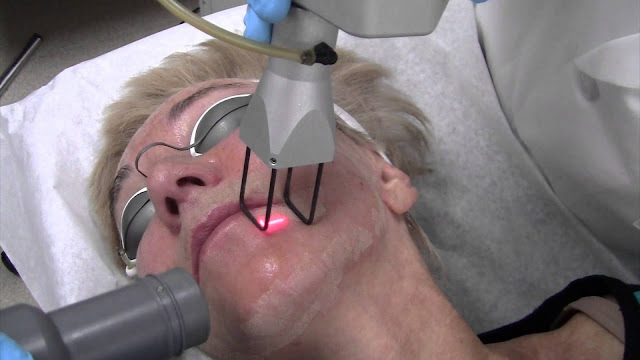 Q-switched lasers are particularly helpful at removing dark scars. Typically several treatments are needed and we perform them monthly. What options are there for textured scars? When we say “textured”, we are normally referring to a flat scar or slightly indented scar that feels and looks different than the surrounding skin. It may have a waxy or shiny appearance or even be a bit lighter than the surrounding skin. With this textured scars, we typically use fractional laser resurfacing. Fractional laser resurfacing involves uses a laser with very tiny beams of light (less than 1 mm wide) to make perforations in the skin. 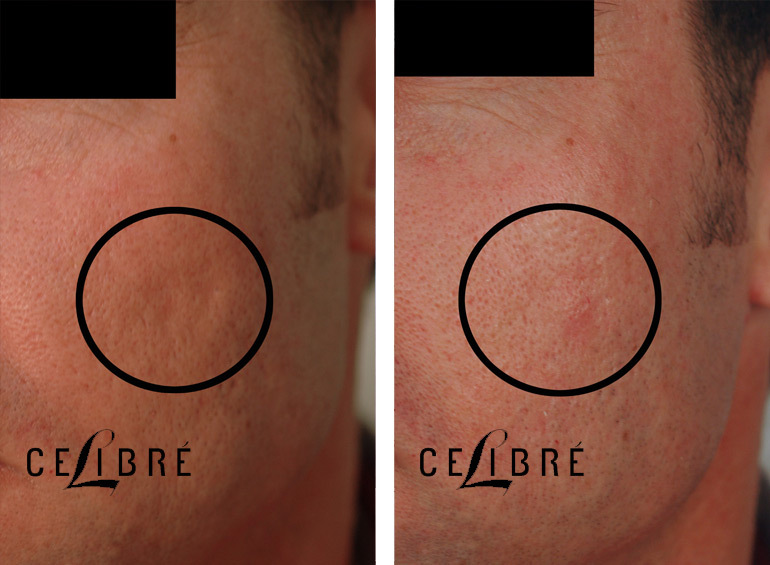 At each of these tiny perforations, the scar tissue is removed and new collagen fills in the area. This process is repeated and is used to redevelop new collagen and skin while replacing scar tissue. What laser treatments are there for acne scars? Acne scars can be red, brown, indented and/or raised. For this reason, we use a combination of treatments, sometimes including several lasers. What about injections for acne scars? Periodically we do offer Restylane andsubcision for wider, deeper acne scars. With wide, deep depressions, it is possible to lift the area up creating a smoother appearance by using Restylane, Restylane Lyft, Juvederm or other dermal fillers. Results are not permanent, but in some cases, there may not be a lot of options. Kevin DiCerbo is the Director of Celibre Medical. He has been working side by side with Dr. Kaplan since 2004 and has managed Celibre Medical since its inception. He is a certified medical laser safety office (CMLSO) and uses his knowledge of laser physics to help patients understand laser hairremoval. He also oversees the day to day administrative activities at the two offices. He has a BS in Engineering from Cornell University and an MBA from UCLA. So there you have it. As you may or may not know, I do have a scar on my leg that I wish to get rid of and laser scar removal seems like a safe and effective method to do so. I hope this post has been useful to you as it has been for me. Quick word of advice, remember to always look up medical terms & procedures that you are unsure about as well as doing a quick check about the background of any clinics before going for treatments. Disclaimer: This is a sponsored guest post courtesy of Celibre.